First, the mee goreng. 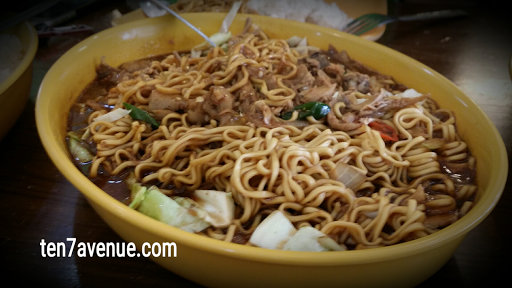 It is a Malay noodle dish that has some spices mixed with some vegetables. This is commonly known as the fried noodles. They say it is not spicy but for me, it is; or I have eaten a chili in it. hahaha However, it is oh so good. Second, the beef kulma. 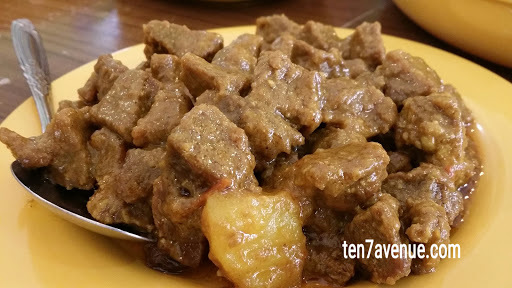 The soft beef meat is cooked with spices and sauce similar with curry. This is a winner for me! I just love the spice in it that is not too strong and the softness of the beef - not gummy. Fourth, tiyula itum or known as the black soup. 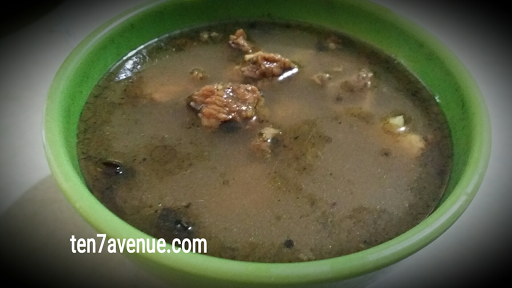 This is another Tausug dish that is either with beef or goat meat. It is a soup with some spices too. When you mix the soup, some black residue from burnt coconut will appear. They say it is spicy but not really. It tastes good! Seventh, the satti! It is a perfect dish for breakfast! The meat is grilled, then after grilling it will be dipped on this red spicy hot thick sauce - I don't know the components of it but I am sure it is not catsup! It has rice in it which I think is cooked through coconut leaves or known as the pusò. 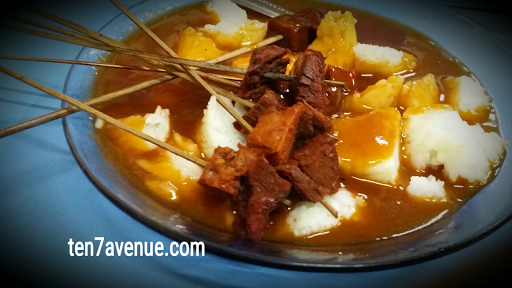 Many associate this dish in Zamboanga, but this is a perfect satti in Jolo, Sulu. It is just really perfect! Then, there are some snack items to choose from. First, the apam. It is known as the Tausug pancake. It is thick and good to eat when hot. 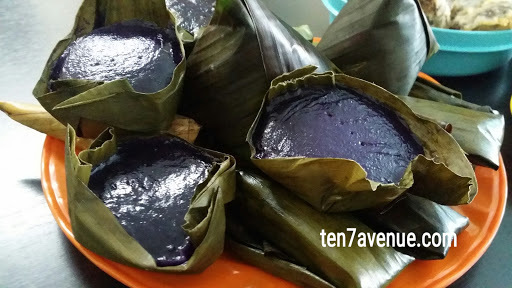 Second, the purple part of sapin-sapin or the sticky rice cake. Third, the pitis, one of my favorites! 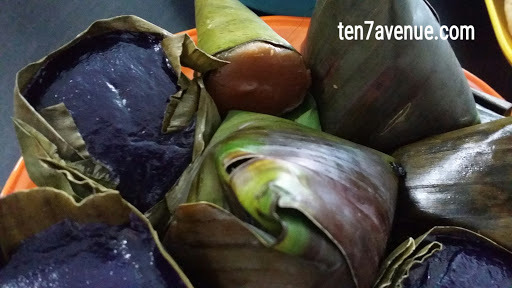 It has a sweetened desiccated coconut inside covered by a purple sticky rice. Fourth, the panganan or unknown. It is not a joke, but it is for you to name the dish. 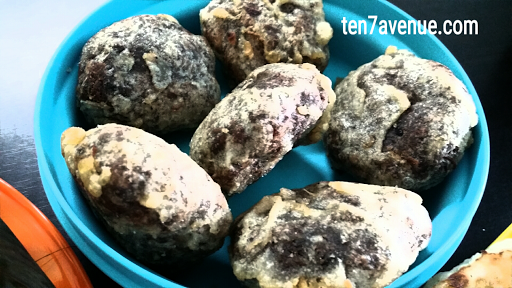 It is a red bean (red mongo) cake which I think is fried because of its crispy texture. I also love this. Lastly, the punjung and wajit. Do you see that conical dish at the top center? That is punjung. A snack item which is made of rice flour which is a bit sweetened cooked through steam. Unfortunately, the wajit is not opened in this photo. The big one at the center which is wrapped by a banana leaf. 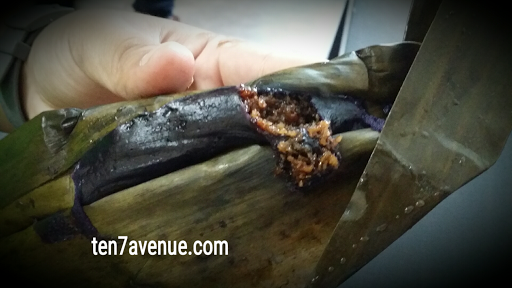 I also love this one; it is like the biko or the common rice cake in the Philippines yet mixed in brown and purple. These food are really awesome! The spices... The coconut component of the dishes... The grilled food... The snack items... Everything is worthy to try and taste! That's plenty to serve, isn't it? That's not yet all that can be tasted in Jolo, Sulu. 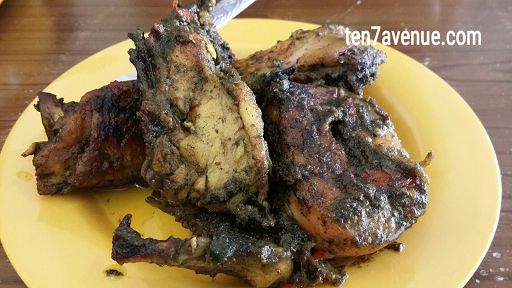 Halal prepared food is plenty in Sulu archipelago. 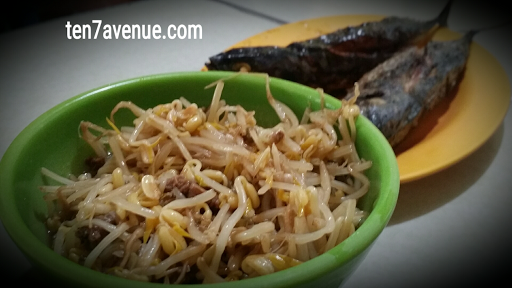 A lot of food that are traditionally prepared and constant to our Malay heritage. 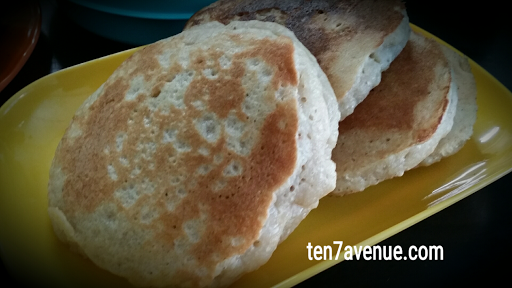 I hope you share your story, too, here in my avenue, www.ten7avenue.com. Dishes would be more interesting if you mentioned the prices. Salamat sa info master.